Lakeland upset Westchester to advance into Conference Final. Magic forced 19 Knicks turnovers. Worth to mention a great performance of forward Amile Jefferson (206-93, college: Duke) who helped to win the game recording 21 points and 9 rebounds and swingman B.J. Johnson (201-95, college: La Salle) who added 20 points during the contest. Four Magic players scored in double figures. Point guard Sekou Wiggs (193-94, college: Alaska-Anch.) responded with a double-double by scoring 23 points and 10 rebounds and forward Isaiah Hicks (206-94, college: UNC) produced a double-double by scoring 16 points and 10 rebounds (on 8-of-9 shooting from the field). Both coaches tested many bench players and allowed the starting five to rest. 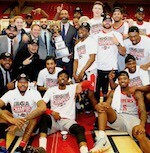 Long Island Nets eased past Raptors 905 to reach Eastern Conference title game. Long Island Nets made 20-of-25 free shots (80.0 percent) during the game. They also forced 20 Raptors 905 turnovers and outrebounded them 58-38 including a 16-4 advantage in offensive rebounds. Long Island Nets looked well-organized offensively handing out 23 assists. The winners were led by Bosnian Dzanan Musa (200-99, agency: BeoBasket) who scored that evening 21 points and 8 rebounds and forward Theophilus Pinson-Jr (198-95, college: UNC) supported him with 20 points and 7 assists. Even 33 points (!!!) 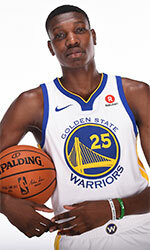 and 7 rebounds by Canadian-Saint Lucian power forward Chris Boucher (208-93, college: Oregon) did not help to save the game for Raptors 905. Guard Wade Baldwin-IV (190-96, college: Vanderbilt) added 18 points, 8 rebounds and 4 assists for the hosts. Five Long Island Nets and four Raptors 905 players scored in double figures. Both coaches allowed to play bench players saving starting five for next games. Santa Cruz stayed in the title race as they overcame OKC Blue. Warriors forced 20 OKC Blue turnovers. They looked well-organized offensively handing out 29 assists. Guard Kendrick Nunn (190-95, college: Oakland, agency: Pensack Sports) orchestrated the victory by scoring 31 points. Guard Jacob Evans-III (198-97, college: Cincinnati) contributed with 16 points, 8 rebounds and 6 assists for the winners. Forward Kevin Hervey (206-96, college: UT Arlington) replied with a double-double by scoring 18 points, 10 rebounds and 5 assists and swingman Scotty Hopson (200-89, college: Tennessee) added 21 points and 7 rebounds in the effort for OKC Blue. Four Warriors and five OKC Blue players scored in double figures. Both coaches used bench players which allowed the starters a little rest for the next games. Rio Grande will play in the Western Conference Final after they dismantled Memphis. Rio Grande Valley Vipers made 17-of-19 charity shots (89.5 percent) during the game. Rio Grande Valley Vipers outrebounded Hustle 57-34 including a 22-6 advantage in offensive rebounds. Their players were unselfish on offense dishing 27 assists. The best player for the winners was guard Michael Frazier (193-94, college: Florida) who scored 33 points (!!!) and 8 rebounds. German power forward Isaiah Hartenstein (211-98) chipped in a double-double by scoring 22 points, 15 rebounds and 5 assists. Guard Dusty Hannahs (190-93, college: Arkansas) produced 32 points and guard Jevon Carter (188-95, college: W.Virginia) added 23 points and 6 assists respectively for the hosts. Four Rio Grande Valley Vipers and five Hustle players scored in double figures. Both coaches allowed to play bench players saving starting five for next games.